The UFC has long been the dominant brand in Mixed Martial Arts, but their supremacy appears like it will be challenged as Bellator Fighting Championships have also secured a regular mainstream television slot and backed by the prodigious clout of owners Viacom have set out to scoop up free agents and stop their prize talents being poached by the big dog. With the back room moves that have resulted in the UFC putting more than half of their events out, free to view on FOX affiliated channels and opening up Spike TV as a mainstream platform for Bellator, we can easily see the current contractual love triangle between the UFC, Eddie Alvarez and Bellator as the first shot in a war for MMA dominance. Now, I’ve never hidden the fact that before I was an MMA fan, I was a fan of pro wrestling and this situation puts me in mind of the turn of events that led to the most compelling period in that form of entertainment’s history. Lets set the scene. After spending a decade solidifying their dominance and consuming lesser competitors, the long term top dog enters a period of stagnation with older stars retiring, picking their matches and/or falling out with the company and leaving. Now, of their competitors, there is only one significant domestic opponent left, a company which has long seemed a little bit… shall we say parochial? This company has however established a reputation for putting on quality matches, booking consistently and generally doing its job well, even if the production values, marketing reach and star power aren’t quite there. What happens when that underdog competitor gains some momentum, gets a backer with enough finance and clout to equal and perhaps even exceed the long term market leader? Then my friends, we have a competition and has history and entry level economic theory has shown us, this leads to great things for everyone involved, except perhaps the stress levels of the higher management of the rival companies. Anyone with the slightest knowledge of pro wrestling in the 90s and MMA now will see that I’m drawing parallels between the then WWF and the modern UFC and the one time Jim Crocket Promotions, later better known as WCW and Bellator. Of course, it’s not a perfect analogy – I don’t expect Bellator to poach Georges St-Pierre from the UFC anytime soon (or, ever…) in the way that WCW drew Hulk Hogan, Randy Savage, Lex Luger and later Kevin Nash and Scott Hall from the WWF and with the differs business models and broadcast arrangements on show, the competition isn’t as direct as it was during the Monday Night Wars. Back in the 90s, WCW and the WWF competed over TV ratings for directly opposing cable TV shows, with monthly pay per view but rates as a secondary way of keeping score. Of course, Bellator and the UFC aren’t directly competing at any point as UFC events invariably take place on Saturdays while Bellator have settled on Thursdays. It’s also worth noting that Bellator don’t (yet) offer the PPVs which make up about a third of the UFC’s output and remains their major source of income and that the respective reach of Spike TV is different to the UFC’s various televisual homes (FOX being more widely available, FX and Fuel TV less so) which makes a direct comparison of viewer numbers pointless. However, the point is that all of a sudden, Bellator have the financial clout and sheer visibility to actually offer a serious alternative for fighters and fans. It’s simple economics that when one organisation controls a whole industry (or the whole top strata of an industry) then those who work in that industry and consume its output have greatly diminished choice. In MMA terms, this meant that if you want to watch MMA then the UFC was the only easy thing to find and if you were a fighter who wanted to succeed at the highest level and perhaps retire with enough money saved to REALLY retire, you pretty much had to take what the UFC were offering. Now however, it’s perfectly viable for fans (in the United States at least) to watch a live MMA card every week on their home TV and have the word ‘Ultimate’ never be uttered. Similarly, UFC fighters coming to the end of their contract will be able to dangle the possibility of Bellator being a more attractive prospect to bump up their deals. It also allows free agents who’ve built their name in other, less monied promotions a degree of choice. Market economics dictates that increased competition (defined as an increased number of choices for both consumers, supplies and employees, and when accompanied by a relatively level playing field in terms of consumer information) causes wages to rise, prices to fall and quality to increase. Say that at some point the UFC and Bellator start running live events in direct opposition. At that point, the pressure will be on for both companies to put on a tangibly BETTER show than their rival. Hence, quality should increase. Say that at some point, both companies are running pay per views. Now, folks can only afford so many pay per views in a month and if choosing whether to buy the UFC or Bellator offering this month, price might come into the equation as much as the perceived quality of the card. Thus, prices should drop for consumers and the same should apply to live events. Last year, Bellator’s Middleweight champion, Hector Lombard‘s contract expired and he moved to the brighter lights of the UFC almost as a matter of course. Recently, former Lightweight champion Eddie Alvarez has come to a similar point, yet Bellator feel strong enough in their position to challenge whether the UFC have offered Alvarez a superior contract. 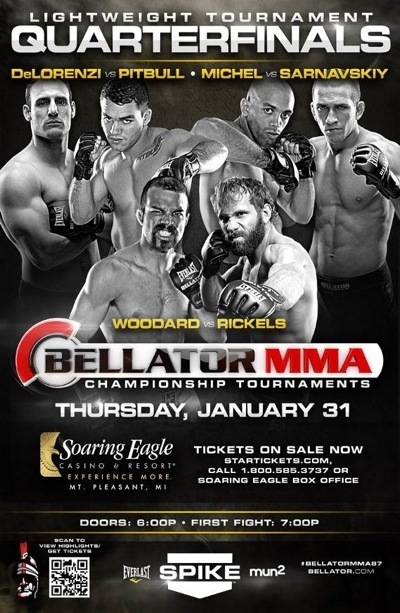 Thus far, judges have ruled in favour of Bellator but this twisted case has a way to run yet. 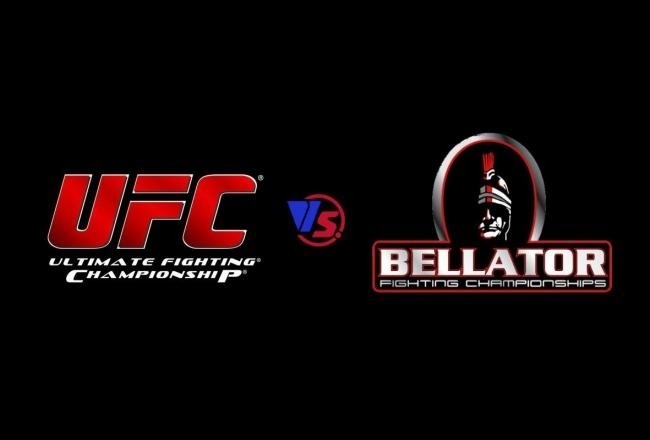 I’m not saying that Bellator are currently or soon to be on a level with the UFC, as a promotion on a cable channel who has never ran a pay per view can hardly compare for clout or opportunity with a company on network TV running over a dozen pay over views a year. The point is, their reach is improving exponentially and the weight of their backing cannot be disputed. That potentially makes things very interesting. In a very real sense, and more as a statement of future intent than an immediate feeling that they can go toe to toe with the UFC, Bellator have drawn a line in the sand and made a “just bring it” motion towards the UFC. All of this may amount to nothing and they may end up as just another ‘next big thing’ that squared off with the UFC and ended up sleeping with the fishes but if Bellator can continue to bring quality, profitable events and appear more like a credible alternative to the UFC in the eyes of fans, sponsors and fighters then the MMA marketplace could be about to experience some of its most exciting and competitive times to date. On Saturday, February 2nd at London’s Troxy UCMMA 32 will be the first event held under the auspices of SAFE MMA, ushering in a new era of safety and credibility for UKMMA. The card, headlined by a Light Heavyweight title match between Linton Vassell (10-3) and Zelg Galesic (11-7) will be broadcast on Primetime and YouTube and if you’re minded to attend this landmark event and don’t yet have tickets, you can get them here. That main event match promises to be a compelling encounter between striker Galesic, who has had great success in the UK previously but has proven susceptible to submissions at the highest level, falling to the likes of Ronaldo Souza in DREAM and Alexander Shlemenko in Bellator faces off with the well rounded Vassell who is riding a five fight win streak since his loss to Matti Makela in 2010. 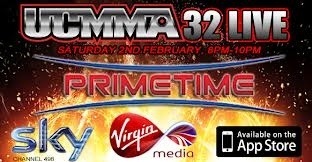 For more information on UCMMA 32, please check www.ucmma.tv. 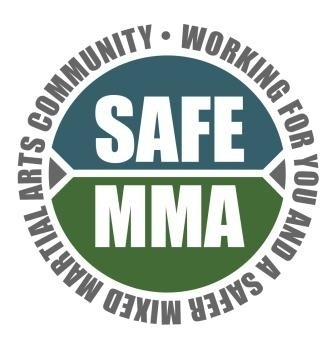 SAFE MMA is a not for profit organisation established to improve the safety of MMA fighters in the UK. Under the Safe MMA banner, the medical centre provides a secure, centralised and confidential database for fighter medical records; and coordinates affordable, standardised blood and medical tests for all registered fighters. Additionally, SAFE MMA members will have access to advice from leading world experts in sports medicine. UK promotions Cage Warriors, BAMMA and UCMMA united to help found the project and have agreed that from 1st January 1013 all fighters on their cards must be registered to SAFE MMA and undergo annual medical tests and bi-annual blood tests. The promotions have agreed only to use fighters that are deemed medically safe to fight under the SAFE MMA (green light) system and not to use fighters that are suspended due to injuries, such as concussion, or who are overdue for blood tests, for example. Additionally, the promotions have pledged to have medical professionals carry out pre- and post-fight tests with all results to be submitted to the confidential medical database at 76 Harley St. Medical data will never be transmitted to anyone but SAFE MMA will be able to give a rapid and all-hours service to inform authorised promotions of who is medically safe to fight and who needs to be rechecked, at the time of enquiry. Visit www.safemma.co.uk for further information. 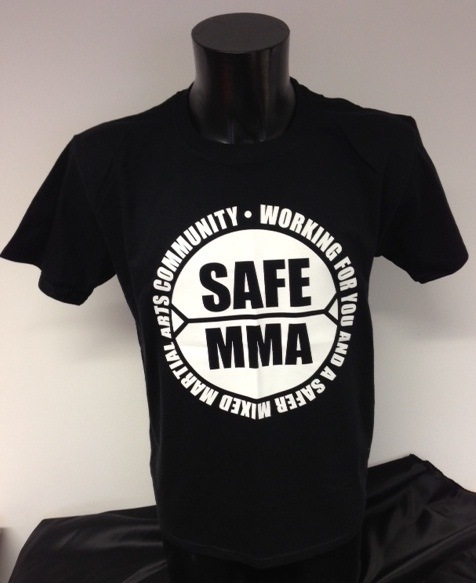 To coincide with their first event, SAFE MMA have released their own line of Safe MMA Apparel via British MMA clothing brand, Impact LPA; with branded T-shirts in black and in white available now from www.impactlpa.com. Bespoke Safe MMA branded designs are also available for promotions, gyms or retailers on request. Impact LPA has generously pledged to donate all profits generated from the sale of all Safe MMA apparel to a fund for fighters needing financial assistance with Safe MMA registration fees. Please, show your support for UKMMA by checking out UCMMA 32 in person or onscreen and by ordering yourself one of these stylish t-shirts. We will be. Follow @SAFEMMAUK and @UCMMA on Twitter. BAMMA today announced two matches for the BAMMA 12 main card, set to take place at Newcastle’s Metro Radio Arena on Saturday 9th March 2013. 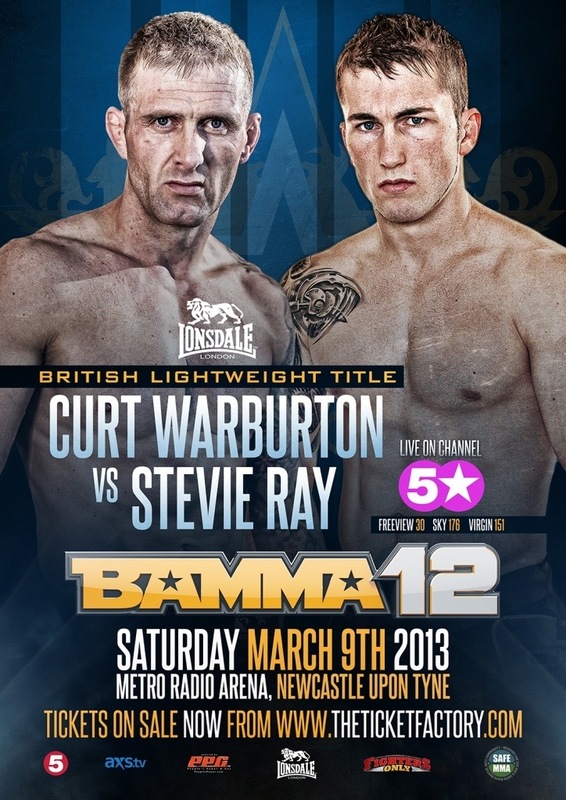 First up is Steven Ray vs. Curt Warburton in a square-off for the BAMMA Lonsdale British Lightweight title. Reigning BAMMA Lonsdale British Lightweight champion, Steven ‘Braveheart’ Ray, debuted at BAMMA in December 2012 where he earned the title in a distance bout against Dale Hardiman. Hailing from Scotland, the Judo black-belt turned MMA Pro in 2010 and dominated the Welterweight division on the Scottish circuit to claim the On Top Welterweight belt before dropping to Lightweight for his BAMMA 11 title shot. Ray presents a professional MMA record of 12-3-0; and his clash with Warburton marks his first defence of the BAMMA Lonsdale belt. Curt ‘The War’ Warburton presents a formidable challenge armed with a catalogue of notable wins on his 11-3-0 record, most famously against Ross Pearson. Warburton fought three times in the UFC before fighting Tim Newman at BAMMA 8. BAMMA 10 saw Warburton return for a World Lightweight title contenders match against Lee Wieczorek, in which he delivered his second BAMMA decision win. Warburton was slated to challenge BAMMA’s World Lightweight champion, Rob Sinclair, on the forthcoming card, until Sinclair was forced to withdraw injured; leaving Warburton to set his sights on another BAMMA belt. The second bout announced will be a Welterweight match between Bola Omoyele and Wayne Murrie set to feature on the preliminary card. American Top Team and Team Titan fighter, Bola ‘Cashflow’ Omoyele, boasts a record of 6-1-0. Bola has achieved 5 of his wins within 2:45 and none of his fights have reached the third, with the majority coming by TKO. Bola participated in reality TV series ‘The Ultimate Fighter: The Smashes’ in 2012, in which he was defeated by Manny Rodriguez in episode 5. West Yorkshire’s Wayne ‘Mayhem’ Murrie carries a record of 15-5-1and has a history of tough clashes against experienced opponents. With 12 of his battles not leaving the first, Murrie has also shown he can go the distance against names that include John Maguire and Peter Irving. With victories through Knock Out power, via TKO and Submission, Murrie has defeated half of his opponents via an array of Chokes. BAMMA 12 will feature on Channel 5 and on 5* in the UK; and will be televised on AXS-TV in the US, The Fight Network in Canada, Red Media in Russia, TV Esporte Interativo in Brazil and Setanta in Africa. With more matches soon to be announced, we’ll keep you updated with any further BAMMA announcements. Anderson Silva: What next for the GOAT? Say the name Anderson Silva to anyone involved with MMA today and you will likely be met with a string of superlatives describing his lightening fast speed, cat like reflexes, pin-point accurate striking, etc. There are very few, if any, that would place him anywhere other than No.1 on the Pound for Pound list, with most of them claiming that not only is he the best fighter in the game today but in fact the greatest of all time. During 2012, with Anderson concentrating mainly on his rematch with Chael Sonnen and then the unexpected fight at Light Heavyweight with Stephan Bonnar, the contenders at his usual home of Middleweight began to stack up. Names like Mark Munoz, Tim Boetsch, Michael Bisping, Chris Weidman, Hector Lombard & Alan Belcher were just a few names being thrown around, with the UFC at one point even announcing a possible MW tournament in order to determine Silva’s next challenger. With an unbeaten record of 9-0 and coming off big wins over Demian Maia & Mark Munoz, with the latter earning Weidman KO of the Night honours, it is pretty much a given that Chris is the defacto, by the numbers No. 1 Contender at Middleweight at this point in time. He has certainly been doing his level best to hype the idea of the fight himself over the past few months, however Anderson has so far been less than enthusiastic about the prospect claiming that he does not feel he is a big enough name yet to make it worthwhile. This has led to some quarters claiming that Anderson is ducking Weidman due his wrestling skills, which after Chael Sonnen’s first performance against Silva, would appear to be his weak spot if indeed he has any. Whether this is enough to motivate Anderson to sign on the dotted line remains to be seen. The AKA fighter was the last Strikeforce Middleweight champion before they were recently folded into the UFC and he is currently awaiting his first fight for the organisation. The story side of this writes itself with any fight between the 2 likely to be billed as Champion vs. Champion to unify the UFC & Strikeforce belts. Anderson has expressed some interest in this bout which could well be the tipping factor in any decision. Rockhold is a brown belt in BJJ and started his MMA career with a string of 1st round submission victories, but has also shown in recent fights that he is capable of getting the TKO or working his way to a decision victory over a full 5 rounds which makes this a potentially compelling matchup. All that could stand in Luke’s way however is that with no fights in the UFC as of yet under his belt and the fact that he isn’t as big a draw as some other candidates either Anderson or the UFC could decide to hold off on throwing him straight in at the deep end. Belfort should need no introduction to even the most casual of UFC fans. He is a former 2 weight class champion aswell as clocking in a number of fights at Middleweight, including a previous title shot with the man in question back in Feb of 2011. Despite the fact that that fight ended in one of the most recognisable knockouts in Silva’s resume, the shortness of the fight and the fact that Belfort never really got a chance to show what he was capable off could make for an intriguing rematch. Vitor has only lost to Silva and Jon Jones, arguably the 2 best fighters in the world today, since 2007 and is coming off and impressive win over Michael Bisping. After that fight he chose to call out Jones for a rematch instead of Anderson though so it could be that Belfort simply isn’t interested at taking another shot at the MW belt at this time. A surprising name to be placed under main contenders I hear you say? Well, yes, but Cung is the one guy that Anderson Silva and his manager Ed Soares have come out and said they would have some interest in fighting. Their logic is that at this stage in Anderson’s career they only want to be fighting guys with some name and drawing power who are coming off wins, and on paper at least that would seem to apply to Le. It is also worth remembering that the UFC is committed to cracking the Asian market and having Cung challenging for the title as the headline of an event in China for example could really work in the the their favour. The only possible downside I could see here is that Cung is 3-2 in his last 5 fights which isn’t exactly No. 1 contender form and the UFC have already been taking heat of late for some rather questionable choices for title shots. Lombard is coming of an impressive win over Rousimar Palhares and Okami recently defeated Alan Belcher to remove him from contention. They will now face each other in Japan in March and if either gets an convincing win then they could catapult themselves right into the mix. Granted it is not that long since Okami had his last shot so the odds on him are surely longer than they would be on Lombard if he was victorious. The timescale aswell might not fit however, especially if the winner needed some time to heal up after the fight which is why they are outside contenders at best. Costa has been somewhat of a dark horse quietly working his way up the rankings over the past couple of years. He is currently riding a 5 fight win streak, the most recent of which was when he stepped in at UFC 155 on short notice against Tim Boetsch. He may not have been tested much at the top of the division so far but he has proven himself to be a tough competitor and has provided some entertaining fights so should an injury crisis akin to that of last year happen again then he could yet find himself staring across the Octagon at The Spider sooner rather than later. The former Strikeforce champion is one of the top prospects to come from the fallen organisation, and had he not lost the Middleweight title to the aforementioned Rockhold he would surely have been all but certain of a shot at Anderson at this point. Even with that loss though he has since put together a 3 fight win streak and remains a compelling matchup given that he possesses arguably some of the best BJJ in MMA today. Although, the fact that he is a Blackhouse fighter could be the fly in the ointment. They are known as being a very close knit team so both fighters could be reluctant to face each other. Khalidov is by far the longest shot of all the contenders I have mentioned so far given that he is not even in the UFC at this point. A lot of casual UFC fans will likely not even have heard of him, however the current KSW Middleweight Champion has long been considered one of the very top talents outside of the UFC. In fact they have already tried to sign Mamed, offering a contract which he turned down as he was making more money with KSW. The reason I include him on this is partly because the UFC have already shown interest and I think it is inevitable that we will see him in the Octagon at some point, but also that Dana White made a statement after UFC on FOX 6 last week, saying that they were waiting on something before announcing Anderson’s next opponent, could it be they are waiting on Khalidov accepting a new contract offer? It’s a long shot, especially since his name value in the States is minimal, but surely stranger things have happened. Dana White has said that Silva’s next fight will not be a super fight, however knowing that anything can happen it seems only right to include them as potential candidates however unlikely they may be at the moment. GSP is the current UFC Welterweight Champion and arguably the No. 2 pound for pound fighter in the world behind Anderson Silva. The talk of a super fight between the 2 has rumbled on for a number of years. It was thought unlikely until very recently when Silva for the first time expressed an interest in facing St-Pierre. GSP is currently set to face Nick Diaz in March so any fight with The Spider would need to wait until after then and would likely be dependent upon him beating Diaz. Another potential stumbling block though is that GSP himself has never fully committed himself to the fight, stating that if it ever were to happen then he would need 6 months to make a permanant move to Middleweight the right way. 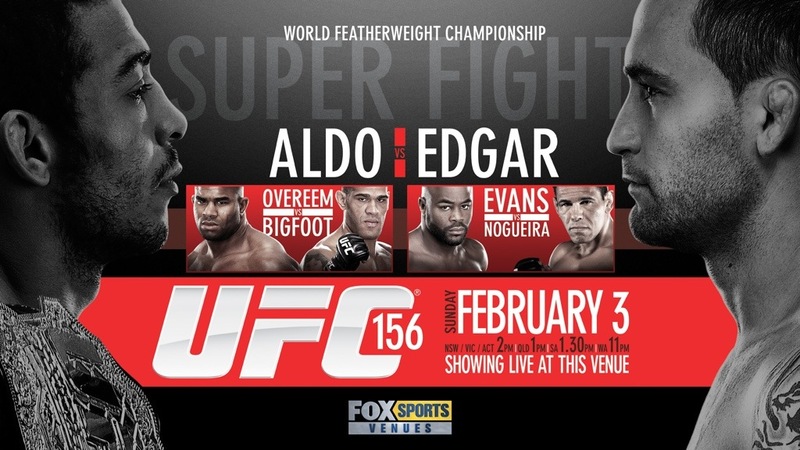 All these factors included it would seem very unlikely that this will be appearing on Silva’s schedule in early to mid 2013. If you believe the internet and general media chatter then this is the biggest fight available to the UFC at the moment and would be the majority of fans first choice. Jones has pretty much walked through everyone presented to him at Light Heavyweight thus far and with Anderson having previously moved up to the division there would be no weight issues getting in the way. Even with White saying that he all but guarantee’s that the fight will happen at some point before Anderson retires, both Jones & Silva had said that they are not interested in the fight any time soon. Add that to the fact that Jones is set to face Chael Sonnen in April and it would seem that this too would be unlikely to happen this spring. So that covers off all of the potential candidates I think are in any way whatsoever in the running to face Anderson. If I were to predict who I think it will end up being then my gut is telling me Chris Weidman. Despite Silva saying he is not interested in the fight due to his name value he has been doing his best to raise his profile recently and really cement himself as the No. 1 contender. He was in Chicago for UFC on FOX last weekend simply to track down Dana White to beg for the shot and he really seems to think that he can become the next champion. This isn’t the first time Anderson has said he wouldn’t fight someone and then did so I get the feeling history will repeat itself and we will see Anderson Silva vs. Chris Weidman for the UFC MIddleweight Championship sometime soon. Do you agree/disagree? Do you think there is anyone I have missed out? Please feel free to get the discussion flowing and let me know. Three weeks into their tenure on Spike TV, Bellator Fighting Championship face the first real test of their credentials and the first chance we’ll get to see what their ratings really look like. In their debut and sophomore cards on Spike, Bellator combined the curiosity factor of being a new show with three title matches and the big name debuts of fighters who’ve earned greater acclaim elsewhere. This third week lacks a title match, the much awaited debut of a former Zuffa fighter, even one of Bellator’s hit and miss ‘super-fights’ and strips the promotion down to it’s bare bones, it’s core hook, the thing that set Bellator apart from other domestic promotions and continues to make it a distinct and compelling part of the wider pantheon of MMA. That is of course, their recurring championship tournaments, whereby ‘title shots are earned, not given’ and while we have had the first rounds of the Light heavyweight and Welterweight tournaments over the past few weeks, they’ve been very much in a supporting role. This week, they step into centre stage with one of Bellator’s most reliably compelling weigh classes – Lightweight. Topping the bill (at least by my reckoning, there seems to be no real consensus as to which bout is the main event) is the bout pitting Patricky Friere (10-4) against Guilliame DeLorenzi (10-1) which should be guaranteed fireworks as these tow have a chunky fifteen knockouts in a combined twenty wins. That’s a 75% chance of a knockout. I like those odds. Friere has been one of Bellator’s go-to-guys for a while, but currently sits on a 1-3 run with his re-retiral of Kurt Pellegrino offset by losses to Michael Chandler, Lloyd Woodard and Eddie Alvarez. On the other hand, DeLorenzi comes in on a 5-0 streak including four finishes since his sole career loss to the fighter formerly known as John Koppenhavner. DeLorenzi has all the momentum, but it’s worth remembering that Friere has lost to a superior quality of opposition to anyone he’s faced and also holds the advantage in terms of age and experience (a rare combination) but there’s always that question as to whether his chin or mind have been broken by his losses. Next up comes Russian submission ace Alexander “Tiger” Sarnavskiy (21-1) looking to improve on his 1-1 record on US soil, having bounced back from a split decision loss to Rich Clementi on his Bellator debut. Across the cage from Sarnavskiy is a Brazilian knockout artist with a weakness for being subbed, Thiago Michel (11-3). With Sarnavskiy having never been stopped and all three of Michel’s losses coming to superior grapplers, I’m gonna have to place my bet in this grappler vs. striker bout on the Russian. The next bout is between two guys who’s only losses have come against guys who’ve gone on to win tournaments as Lloyd Woodard (12-2) and David Rickels (11-1) face off in a contest of submission specialists. Woodard’s losses to Michael Chandler and Rick Hawn came via decision and KO, while Rickels sole loss came via split decision to the larger Karl Amoussou. I’m tempted to go with Woodard here, but I have a suspicion the younger Rickels might make his size count. This match is a real acid test for Brooks in his first truly high profile match in the US, while Tirloni will be looking to improve his workmanlike 2-2 record in BFC. As usual, Bellator have assembled a lightweight tournament which has some familiar names, some of the usual suspects and some wild cards. If I had to call a winner at this point, I’d probably pick Friere or Sarnavskiy but couldn’t count out anyone in the field, especially after the upsets in the opening round of the LIght Heavyweight Tournament. The main card line-up for Cage Warriors 52 is now complete following today’s addition of an exciting lightweight clash to the bill. 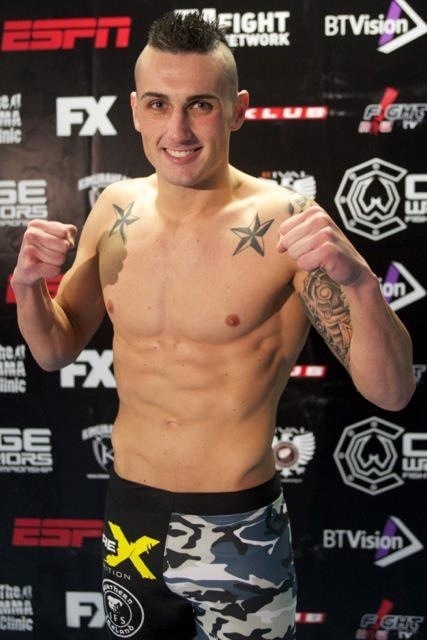 Tommy Maguire will face Merv Mulholland at CWFC’s opening event of 2013, which is set for London’s HMV Forum on Saturday, March 9. Maguire (14-5), who recently signed an exclusive Cage Warriors contract, will be making his CWFC debut on the back of a run of five wins in his last six outings. The younger brother of UFC welterweight John Maguire, 25-year-old Tommy appeared on season nine of The Ultimate Fighter and hasn’t been stopped since a second-round TKO defeat to John Hathaway back in 2007. Mulholland (10-4), who has taken eight of his 10 wins by first-round stoppage, will be looking for a third consecutive Cage Warriors victory on March 9. The 22-year-old, who hails from Belfast, is currently ranked 14th in the UK and secured a Submission of the Night bonus for his defeat of Daniel Thomas at Cage Warriors 49 in Cardiff back in October. Cage Warriors 52 will be headlined by a welterweight title bout between Cathal Pendred and defending champion Gael Grimaud and we’ll keep you posted with any event updates.